once picked and out, I can get the core rekeyed to the same key as the other padlock. I would like to get the core picked and out in the most NDE way possible. Has anyone considered tensioning this lock via the pin holes, the same as the key would do? I'm thinking that if you make a tool similar to a tubular lock tool, with 2 prongs spaced apart to fit into the 2 pin holes opposite one another you could tension it like that. Obviously you would have to push the pins down a little to fit the tool in, and this could potentially overset the pins, but if you insert the tool minimally, surely you will be able to find a set of pins on the lock face that require setting deeper than the amount you have put the tool in. IE, insert the tool and try picking it, if no pins are bound, the tool may have overset the pins, so move it around a set, and try again. When you find that the tool is in, and a pin other than where the tool is is bound, then you could assume that its not oversetting, and you can pick away. Once like this, you can treat the two pins where the tool is as normal, check them for tension, and pick them, ie depress them furthur if need be. I'm thinking you could make a tool with a diameter that fitted three different sets of pins on the lock face. The sets are marked below. I should think the above would work? Anyone want to chime in here? excellent job macgng did you do the dishes first? adi_picker: gonna try to use the sparrows tool like that, problem is keeping it tensioned. worth a shot. thanks. Is there any follow up on this? TheNamelessOne wrote: Is there any follow up on this? Nope. Still haven’t gotten the core out. How does the control mechanism work mac? Is it a case of inserting the key and rotating it counter clockwise and then the core drops out? Since I posted my thoughts above I was sent some VLs to suit vending machines, and I found them reasonably easy to pick, essentially the same as a tubular lock in a different format. I also settled on a tensioner, a cheap off the shelf wishbone from HPC, which I inserted partially into 2 of the pinholes as I theorized would work above. I would be more than willing to have a crack at picking it for you, but as you know, I am located in Aus :/ Let me know how the control mech works and I will have a bit more of a think for you. adi_picker, i initially tried that. I will mess with it some more and see how it goes. For core removal: Turn the reset key 90 degrees clockwise and pull the shackle out. Keep the shackle out and turn the reset key counterclockwise 90 degrees past the key pull position and remove key. 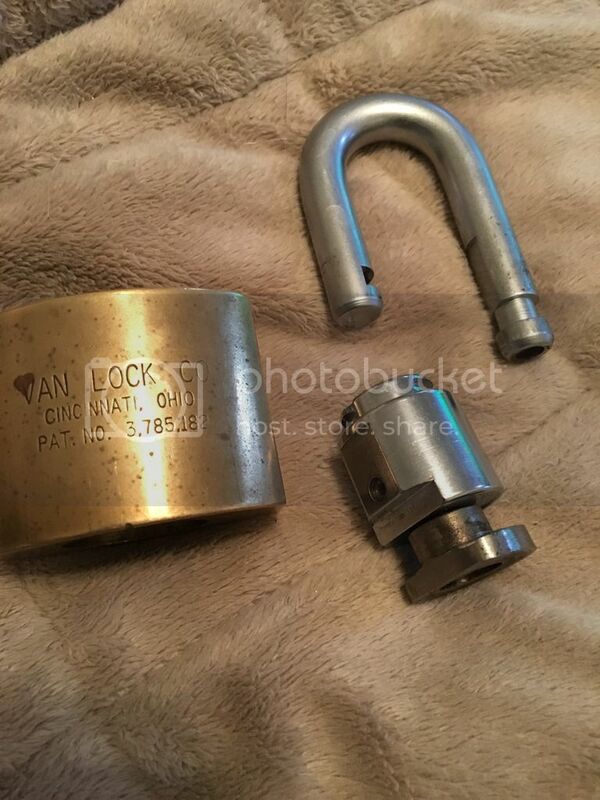 Cylinder and shackle should come out of the lock body. Sounds to me like the core is only retained by the shackle, but that wouldnt make sense in normal operation, as if anyone was to leave the shackle open then it would come apart everytime. That would be weird. Does the reset key have a different bitting to the regular key, or is it the same? Is there some sort of pin on the core I cant see that retains it, and is only retracted when using the reset key? the reset key just doesnt have the tabs on the outer ring of the key body... it can be turned in either direction. see the slot on the bottom of the long side of the shackle, the cylinder cam is like a D (round but flat on one side) thats actually all that is holding the padlock together.... it doesn't come apart because when the shackle is up it is still held in by the round part of the cam that is longer than the flat side... when the shackle is down, the cam is locked into the short side of the shackle. Ahhh, I should have read your instructions above more closely mac. The way you explain it with the D shape makes perfect sense now. Sweet I had no idea the core was removable. Ill see if mine is any different. How did you take the core out? I checked mine and couldnt find any way to remove it without force which I dont want to try since I really like this lock. Anyone know a not-too-expensive source for these? I've been wanting to pick a van style tubular for ages. I saw one on a carwash vacuum and it took ages just to identify what kind of a lock it was. I'd love to add one to my picked list. Papa Gleb wrote: How did you take the core out? I checked mine and couldnt find any way to remove it without force which I dont want to try since I really like this lock. sorry i missed your post. Do you have one of the Brass body padlocks? i'm pretty sure it is only this model that has the removable core feature. the newer ones were not meant to be serviced by anyone but the factory. 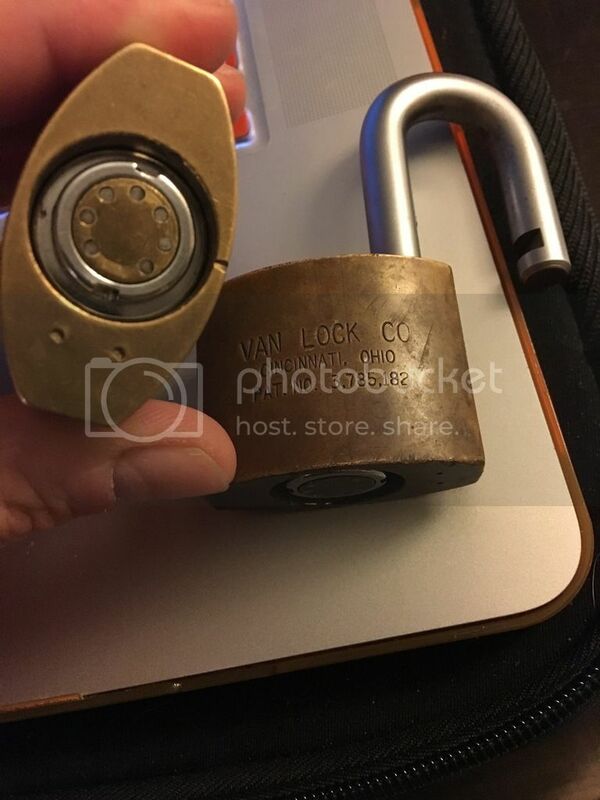 For the brass padlocks you need to have the core removal key which doesnt have the tab guides inside the ring on the face of the key which lets you turn the core in either direction.